Zone 2 Tube station, southern terminus of the Victoria Line. 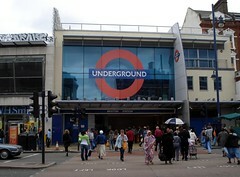 There's also an overground rail station, just around the corner (Wikipedia says: “To get from Brixton tube station to the main-line station, turn right out of the tube and then take the first main road on the right,” which is Atlantic Road). The address given here is for the Tube station. Last edited 2013-10-11 10:13:13 (version 9; diff). List all versions. Page last edited 2013-10-11 10:13:13 (version 9).